Dylan McIlrath knows all about being a big hitter. And not just on the ice. 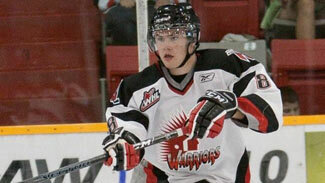 McIlrath is a big, bruising defenseman for the Western Hockey League's Moose Jaw Warriors. Besides pounding opposing forwards, he also knows something about pounding home points on the volleyball court. While McIlrath's winters were spent on the ice, his summers were spent playing volleyball, following in the footsteps of his brother, Sean. He was good enough to draw interest from a number of colleges. But when he hit 10th grade, McIlrath had to choose one sport. "I played (volleyball) until grade 10, when I couldn't anymore," McIlrath told NHL.com. "I really enjoyed it, but it was an easy decision coming to play hockey." The early reviews show he made the right choice. "It's scary to see how far he's come from where he was at in August in 2008 to the middle of February," Moose Jaw coach Dave Hunchak told NHL.com. "The improvement on him is one of the biggest improvements I've seen in a single player ever." The 6-foot-4, 212-pound defenseman had 7 goals, 24 points and a plus-20 rating in 65 games, and his 169 penalty minutes were seventh in the WHL. Those numbers aren't bad for someone who really didn't put his full effort into the game until two seasons ago. "He didn't play midget hockey at 15. 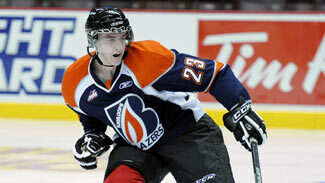 The next year he's playing in the Western Hockey League," said Hunchak. That's the equivalent of a football player jumping to Division I without playing in high school. "To make that step and come the distance he's come, I really can't tell you what the ceiling is for him." The same could have been said for McIlrath the volleyball player, if he had chosen that path. "We had a camping trip two years ago and there's outdoor volleyball courts," said Hunchak. "This kid gets on the volleyball court and it's scary. He was killing the ball and loving doing it." McIlrath said some of the skills that helped him excel on the court have helped him on the ice. "There's lots of power involved, but more the mental aspect," he said. "I had a good volleyball coach, and he was like, if you make a mistake just forget about it. It was nice having that mental aspect of the game." He needed that mental strength when he struggled last season, when he had 4 points and a minus-22 rating in 53 games. "He goes from being a 6-foot-4, 190-pound gangly guy who's Bambi on ice," said Hunchak. "He'd be backing up and with nobody 25 feet from him, he'd explode, gloves and sticks everywhere." Now, Hunchak sees nothing but good things, with even more to come. Next is continuing to add an offensive element to his game. McIlrath finished second in the hardest shot contest at January's CHL/NHL Top Prospects Game, launching a 91.8 mph rocket. "Goals don't really come my way too often," said McIlrath. "Seeing that is a good marker, so I guess I'll have to shoot the puck more from the point. He (Hunchak) already texted me, 'Where has that been the whole year?' "
"I feel he's very similar to (Islanders prospect) Travis Hamonic," said Hunchak. "When we had Travis at 17, he was drafted as a simple, stay-at-home defenseman. At 19 he was still that guy, but he led our league in scoring as a defenseman. He didn't sacrifice the defensive play; he added the other element by doing things at the right time. Dylan, once he figures out what his foundation is as a player, with regards to being hard and a physical player to play against, he can add that (offense) going forward. It's just a matter of you're 17 years old, you're 6-5 and 215 pounds, with size 14 feet and a high-pace game. It's going to take some time." There's no reason to doubt McIlrath will bring that offensive element into his game. Considering how far he's already come in such a short time, there's no reason to doubt him. "What I like about Dylan is how raw he is," said Hunchak. "I don't know what his max potential is going to be if he continues on the pace he's on."